IN HIS SUMMARY of evidence yesterday, Galway coroner Dr Ciarán McLoughlin gave a chronological overview of the events leading up the untimely death of young Indian dentist Savita Halappanavar. He confirmed cause of death was septic shock, E coli in the bloodstream and a miscarriage at 17 weeks. The inquest later returned a verdict of medical misadventure. It was the first direct maternal death at the hospital in 17 years. After reviewing the 31-year-old’s treatment at Galway University Hospital, the coroner noted the systemic failures and deficiencies in the management of her care. Here is how events unfolded. 14 August 2012: Savita attends a local doctor’s practice to hear she is pregnant. She is referred to the antenatal clinic in Galway University Hospital. 11 October: A scan confirms Savita is at 16 weeks gestation. Her baby is due 30 March 2013 and no abnormalities were detected. 21 October: Savita self-referred to GUH with severe back and pelvis pain. She was examined, a diagnosis of lower back pain recorded and physiotherapy advised. She was then discharged. 21 October: Later the same day, she felt something “coming down” and returned to GUH. Again, she told staff of her back pain. It became clear she was losing her pregnancy and she was admitted. A blood test was taken but not read to her medical team that day. It later indicated an elevated white-cell count. 22 October: In the early hours, Savita’s waters break. She was reviewed at 8.20am and all her vital signs were normal. A scan shows there is still a foetal heartbeat but she is told that her baby will not survive. At 5.24pm, the results of the blood test from yesterday are noted. 23 October: Savita requests a termination to expedite the naturally-occurring process. She is told that it is not possible under Irish law on the grounds of a poor prognosis for the pregnancy. Her life is not at risk at this time. Midwife Ann Maria Burke tries to explain the situation to her patient and mentions that Ireland is a Catholic country as a part-explanation. The request for a termination was not noted in the medical records. 23 October – evening: Later on Tuesday, a student nurse and midwife manager Ann Maria Burke are aware of a racing pulse. Two witnesses remember the next events differently. Burke says she relayed details of the tachycardia to Senior House Officer Dr Ikechukwu Uzockwu but he denies being told the information. Savita is not examined through the night. Despite hospital policy, her vital signs are not taken every four hours. 24 October – early morning: Dr Ikechukwu Uzockwu came to the ward at about 1am and finds Savita is sleeping. He did not examine her or check her chart. Later, the patient complained of the cold to a nurse. She was shivering and her teeth were shattering. A nurse gave her paracetamol but neither her blood pressure nor her pulse were recorded. Expert witness Dr Peter Boylan noted that a doctor should have been called at this point. Praveen sleeps on the floor next to Savita’s bed. 24 October: By dawn, Savita’s temperature is raised, and her heart rate has doubled. Severe sepsis was diagnosed by 10.30am. Before then, Savita was put on stronger antibiotics and more tests were ordered. No information about the discharge is relayed to Consultant Dr Katherine Astbury who also doesn’t read notes while examining her patient at about 8.30am. But she is told about the infection and becomes concerned. Dr Astbury was called again at 1pm because Savita’s deterioration was rapid. “She was in peril of her life,” said McLoughlin. More tests are ordered. Sepsis is diagnosed – not severe sepsis because blood pressure is not low. Astbury is still unaware of the vaginal discharge. A lactate test is carried out but rejected because it is in an incorrect bottle. The team is not told. Dr Astbury holds counsel with a senior colleague and decides a termination is necessary. At 2pm, a scan showed foetal demise. Savita was transferred and a female foetus was spontaneously delivered. The team are now aware that the patient is in danger and she is transferred to a high-dependency unit. 25 October: Savita is transferred to ICU, suffering from septic shock. And “despite valiant efforts, the life of this young woman ebbed away,” McLoughlin told the inquest. 26 October: Praveen is told his wife’s life hangs in the balance. 27 October: Family and friends say goodbye to Savita. She is suffering with severe septic shock, has unrecordable blood pressure and high heart rate. She is already on dialysis. 28 October: Savita passes away at 1.09am. 13 November: Kitty Holland in The Irish Times reports that two investigations are underway after the death of a woman who was denied a termination dies in hospital. The story was picked up by media around the world and read by millions of people. 14 November: A candle-lit vigil is held outside Kildare House as a respectful protest about Ireland’s restrictive abortion laws. 16 November: The HSE announce an independent review in the death of the 31-year-old. 17 November: Thousands of people rally in Dublin’s City Centre to demand a change in law which would have seen Savita granted a termination when she requested it. 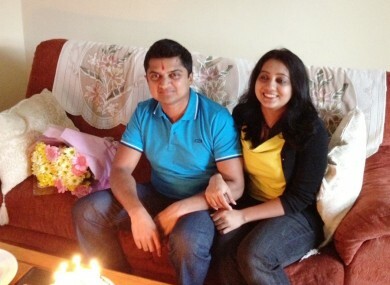 29 March 2013: Praveen Halappanavar receives a draft report from the HSE inquiry into his wife’s death. He says he is not satisfied with it as it does not detail how or why Savita died. 8 April: The inquest into the death of Savita Halappanavar opens in Galway. Dr Ciarán McLaughlin decides. 19 April: A verdict of medical misadventure is returned by the jury. During the inquest, a number of witnesses, including Savita’s consultant Dr Astbury say that if it was legally permissible to offer the patient a termination earlier than when it was given, she would probably be alive today. However, that was not a “practical proposition” because of the law. Email “Timeline: a death that shocked a family, a hospital and a country”. Feedback on “Timeline: a death that shocked a family, a hospital and a country”.